This is the perfect time of year. I love it for the same reason I love May and the same reason the fashion world's biggest shows are in Spring & Fall. You have almost unlimited possibilities when it comes to dressing. You can wear sundresses or you can layer up; you can show your legs, if you like, while still feeling cozy in a new sweater. If you love fashion, then this in-between weather is your best friend! The pieces in this look are both pretty light. They're perfect for now, and when it gets colder, I'll start adding layers over the shirt and closed-toe shoes will help keep my bottom half warm. If you read my post about my Fall fashion inspiration, you'll know I've been real into rocks & stuff lately. 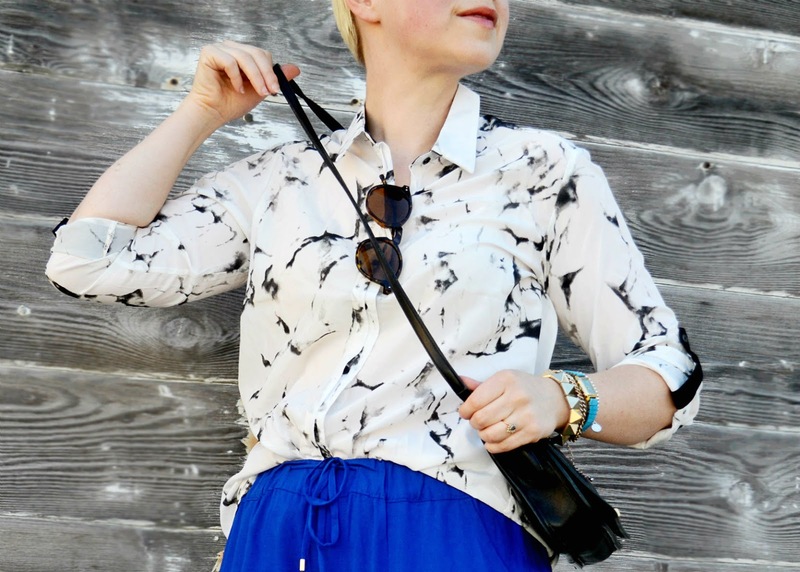 The post on jewel tones actually kind of all started with this marble patterned blouse from Oasap. On the website, they call it "splashed ink", but I immediately thought of marble. I'd been wearing my amethyst necklace all summer and finally put two and two together: I should just go all out! Now I'm looking for a bit of the geode in everything I buy. Even my watch is fake turquoise. It's pretty neat. Sadly, it doesn't work, so it's mostly just a piece of jewelry. If you're looking for one that actually tells times, I found a few similar to it. This Michael Kors' Channing watch features a turquoise dial face. Kate Spade makes a watch with a vibrant aqua leather band. While it's not stone, it's still just as striking! If you're looking for a steal, this Kenneth Jay Lane watch is on sale for $58 and was originally $250! The bag, you ask? Well, it's another vintage Coach! My mom bought it new years ago and, for my 30th birthday, bequeathed it to me. I brought it to my beach party & haven't stopped using it since. I'm in love. Love this! I wish fall was here but it's so hot out still. I love these comfy looking pants and their vibrant blue color. Your bracelet and watch are fantastic too! Adore the blue pants too! You look beautiful! I LOVE the marble print of that blouse!! love those flats and the gorgeous color of your pants!